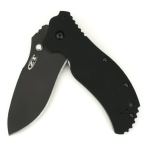 When you want a dependable and well-made folding knife, you want something with a reliable locking mechanism, strong blade, and all-around versatility. 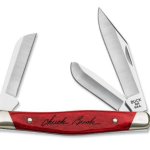 In a knife market saturated with knives of all quality levels – from dollar-store cheapies to custom specialty knives – it can be overwhelming to select the best knife for your needs and price range. Cold Steel’s Voyager series knives make that choice an easy one. 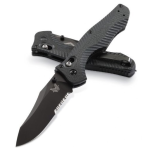 The Voyager is arguably the strongest folding knife on the market, thanks to a combination of quality materials, new innovations, and state-of-the-art workmanship. Check Out Cold Steel Voyagers For Sale On Amazon! One of the most important aspects of any knife is its blade, and this is where the Voyager series truly shines. Blades are made of high-quality Japanese AUS 8A steel. They’re thick and extra-wide, making them strong enough for a variety of uses. Though blades are thick, they’re tapered to a very fine cutting edge, so sharpness isn’t sacrificed for strength. You’ll likely want to keep a knife of this caliber around. The steel has a high carbon content that, coupled with superior heat treatment, makes sharpness last an unusually long time. One particularly unique aspect of the Voyager series is the extensive customizability of the blade. Voyager series knives come in three point styles – clip, tonto, and vaquero. The “clip” blade has a flat, tapered front, the “tonto” is largely flat with a small point, and the “vaquero” has a slightly curved blade. Blades come in three lengths – medium (3″), large (4″) and extra large (5.5″). There’s also the option of Cold Steel’s exclusive serration pattern. Built for versatility, it features clusters of small, fine teeth alternating with shallow arcs. This allows for quick, smooth cutting and shearing through a variety of materials without sacrificing strength. When selecting a knife, you can opt for a plain, smooth blade, a serrated blade, or a partially serrated blade. 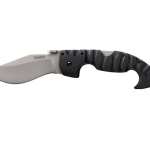 These options make it so there are 14 possible variations in blade types – if you want to select most of the specifications of your folding knife, this series provides ample choice. A good blade is difficult to use without a good handle, and the Voyager series comes with an incredibly strong Grivory handle. It’s aluminum-reinforced for maximum durability, stiffness, and strength. Grivory is one of the strongest available handle materials, and it resists cracks, shrinking, warping, and discoloration. It also is unaffected by moisture, unlike wood and some other handle materials. Well-textured Grivory works superbly to prevent slips, making it very safe as a handle material. Handles are ergonomic to make handling comfortable and effective with a number of grip techniques. Voyager knives also come with the new, innovative Tri-Ad locking system. This multi-pin lock system works to redistribute pressure to prevent lock failures even when knives are handled roughly or used rigorously. Though the locking mechanism is safe and secure, knives can still be opened very quickly should the need arise. The design allows for quick, convenient one-handed opening. The Voyager is especially lightweight, making it a good choice for use in camping or hiking when space and carry weight are at a premium. 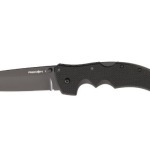 However, its versatility and strength also make it a wise choice for a plethora of other uses, including self-defense, hunting, boating, and general utility work. It comes equipped with a stainless steel belt/pocket slip to make easily-accessible carrying a possibility. Voyager series knives are also aesthetically pleasing – with sleek, tapering blades and attractive, dark-colored stonewash-finish handles, these knives have a minimalist, no-frills appeal that speaks to their utility and craftsmanship. Aesthetics certainly aren’t the most important factor when you’re looking for a high-quality knife, but the classic good looks of the various members of the Voyager series simply add to their existing appeal. Cold Steel has become known for reliability, strength, and value when it comes to knives, swords, and other blades, and this innovative series is no exception. 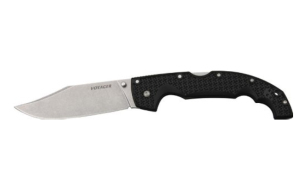 The Voyager series knives are also surprisingly affordable – most are priced between $50 and $100. They’re one of the best deals on the market today – if you want an affordable, well-made knife that lasts and performs well in just about any situation, then you won’t want to miss Cold Steel’s powerful, versatile Voyager series.